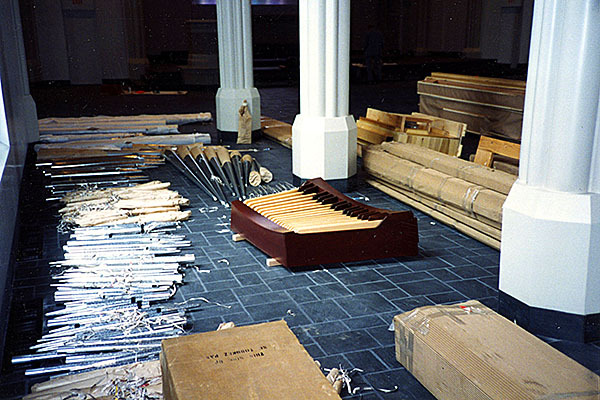 Several years before the chapel’s dedication, former Seminary President Dr. Karl L. Barth began an effort to gather the necessary resources to construct a freestanding chapel on the Seminary’s campus. Since the 1926 dedication of the current Concordia Seminary campus, the Seminary community had used an auditorium in one of its classroom buildings for worship. Barth formed a committee, chaired by Dr. J.A.O. 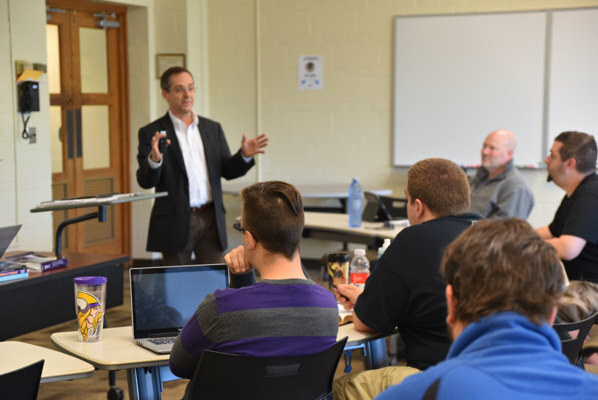 Preus II, to lead a thank-offering appeal in conjunction with Concordia Seminary’s 150th anniversary, which provided the necessary funding for the chapel’s construction. The Chapel uses 407 tons of stone. The Ware Associates architectural firm was commissioned to design a chapel that would reflect the public Confession of The Lutheran Church—Missouri Synod (LCMS) and respect the collegiate Gothic design of the Seminary campus in terms of form, proportion and materials. The site selected for the chapel reflects the desire of the Seminary community to emphasize worship as the activity central to its life and being. The original design of the campus included a chapel on the eastern side of the campus, facing DeMun Avenue, the main entrance to the campus at the time. Changes in traffic flow over the years and a desire to place the chapel at the center of the campus dictated its final positioning. The 28,000 square-foot, 1,100-seat structure provides a substantial focal point for the campus. 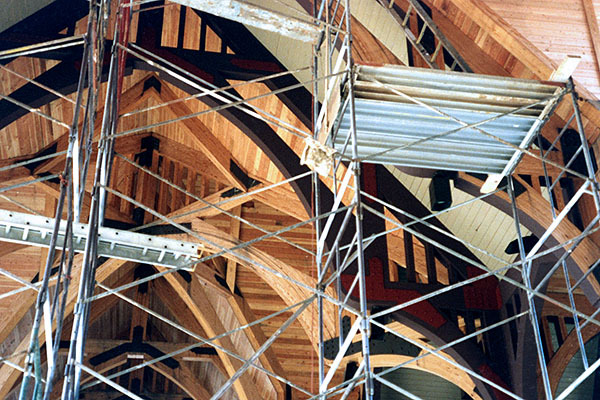 The chapel’s inner frame, up to the roof line, consists of steel beam construction. 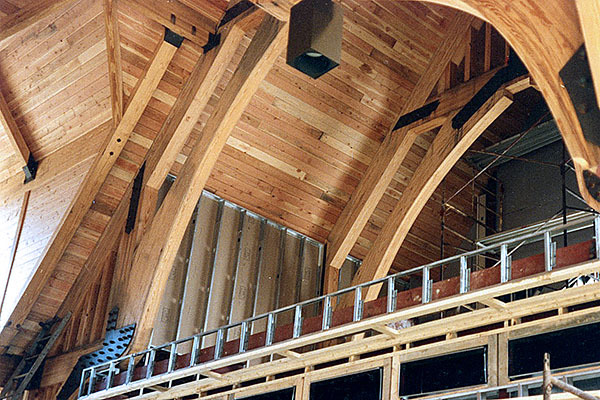 The roof itself is defined by massive southern pine trusses, which were transported to St. Louis by their Arkansas supplier in 13 truckloads. 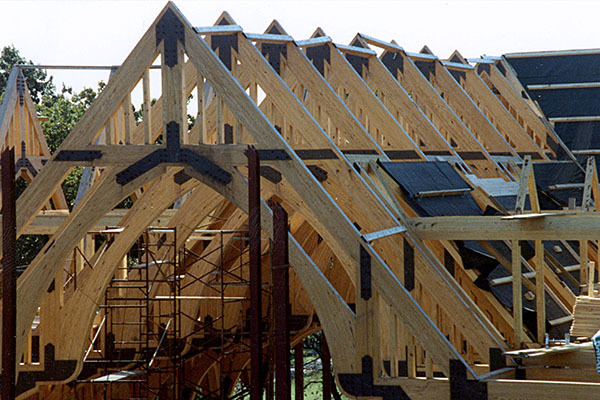 Those trusses support a layer of 3-inch-thick tongue-and-groove pine decking, covered with 3 inches of insulation, a ¾-inch plywood sheath, layers of rubberized building felt, and finally the green and russet-colored slate roofing, all measuring about 8 inches thick. 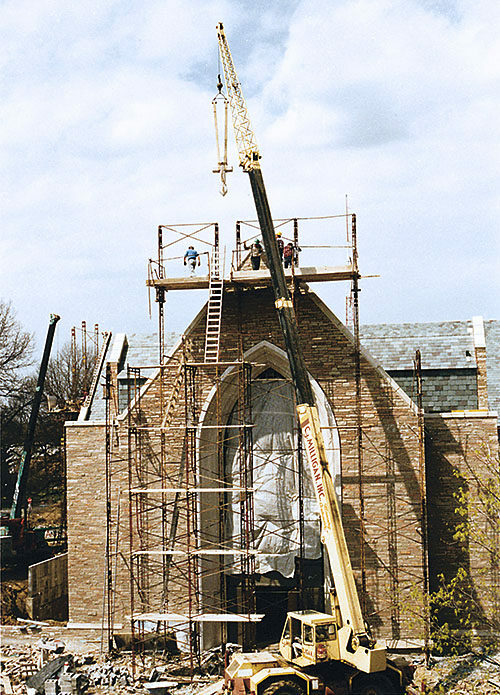 Designed to match the stone used throughout the Seminary’s campus, the 407 tons of stone used in the chapel’s construction have four origins. About 40 percent of the stone, red and pink in color, was selected from Colorado. The gray stone, also comprising 40 percent of the total, is from St. Genevieve, Mo. Ten percent of the stone is limestone from Fond du Lac, Wis., replacing the St. Louis limestone used elsewhere in the campus. The remainder of the stone is Wittenberg brownstone, from Perry County, Mo., where Concordia Seminary was founded in 1839. The original source in Perry County was no longer available for the chapel, but a long-abandoned chimney built for a brewery, made of the same Wittenberg brownstone was located there, donated to the Seminary, dismantled, moved and incorporated into the chapel walls. 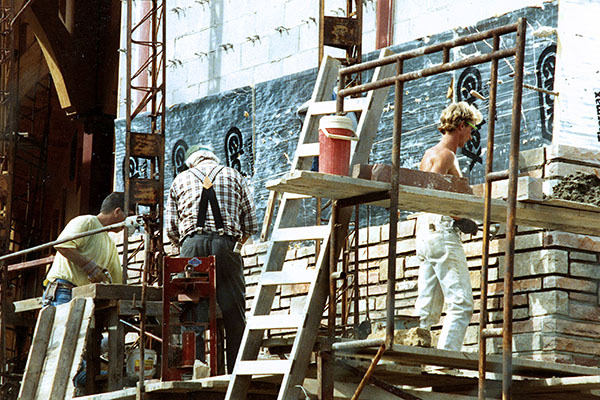 The placing of the cornerstone and the dedication of the Chapel of St. Timothy and St. Titus took place Nov. 14 and 15, 1992, respectively. Since its dedication, the chapel has served as the site for the Seminary’s daily worship services and numerous special worship services for the Seminary and St. Louis communities. It also has served as the venue for the installation of current LCMS President Rev. Matthew C. Harrison and former LCMS Presidents Dr. Gerald B. Kieschnick and Dr. A.L. Barry, and as the venue for the funeral services for former LCMS Presidents Dr. J.A.O. Preus II, Dr. A.L. Barry and Dr. Ralph Bohlmann. 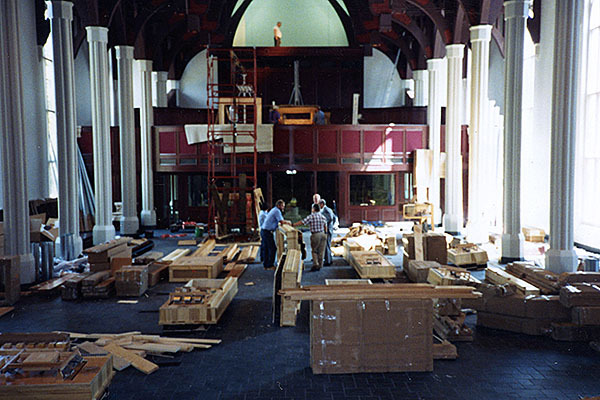 An estimated 1,700 people filled the chapel and all available overflow seating for the Nov. 15, 1992, dedication. Dr. John F. Johnson, president of Concordia Seminary, preached, and Preus and Barth, the Seminary’s eighth president, served as lectors. 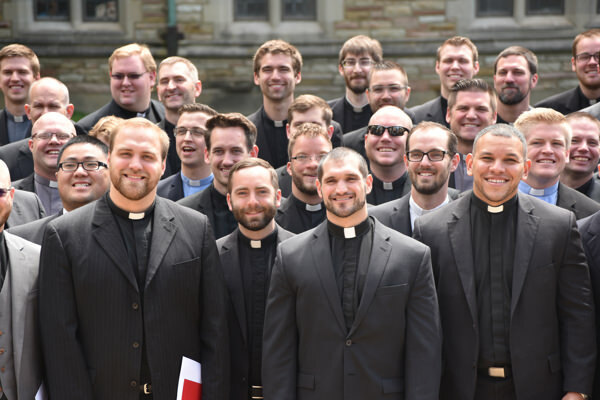 A hymn, “This House with All Its Parts,” was commissioned by Concordia Seminary for the dedication and was written by Rev. Jaroslav Vajda, a 1944 Concordia Seminary graduate. More than 2,000 Seminary students have received their first calls into the pastoral ministry in this chapel since 1992.